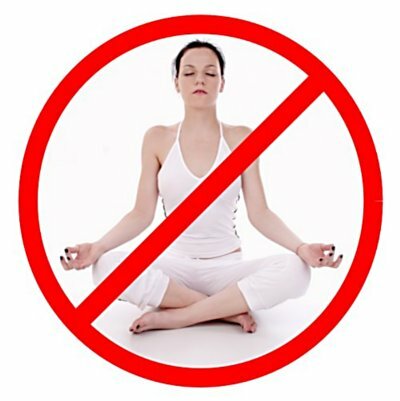 The pictures on this page illustrate Week 4 of our free internet meditation course. Do not sit this way. In advertising, images like this are used to symbolise meditative bliss. In reality, muscular effort is required to maintain this pose. The angle between the spine and thighs is less than 90 degrees – whereas natural sitting requires an angle of greater than 90 degrees. This position rapidly becomes tiring and uncomfortable. The corners of the model’s mouth betray how she feels about being posed this way. 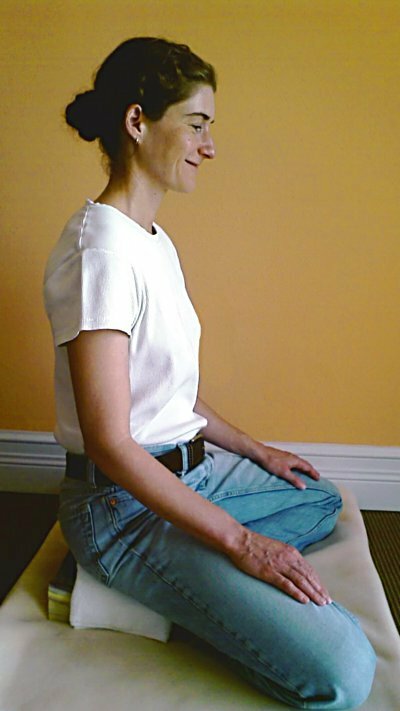 This posture is not good for any type of meditation. A front view of the siddha posture. For most people this is the easiest way to sit on the ground. 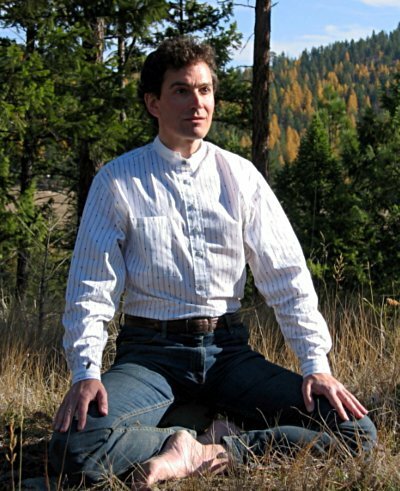 The meditator sits on a log, which raises his pelvis above his knees. Both lower legs are flat on the ground, one ankle in front of the other. His posture is generally good – but his arms are held forward and out, which will not be comfortable in the long run. A side view of the siddha posture, sitting on a telephone directory with a towel folded on top of it. Her posture is generally relaxed and she could maintain it for an hour or more. However, she is slightly contracting her chest, so that her upper back bows back slightly and the back of her neck is slightly concave. She would be more comfortable if she released these tensions.